At Employment Solutions, we pride ourselves on being more than a temp agency. We know that paying the bills is just one reason you work, – it’s also important to be in a job that values your hard work, gives you opportunities to grow, and most importantly fits your lifestyle and career goals. After all, most people spend just over 13 years of their life at work. Jordan welding. Photo credit, Shawn Loseke. ES: How did you find out about Employment Solutions? JM: I responded to a Craigslist ad and an interview was set up at the employment agency. Then they set up an interview at the client and coordinated all the details. They were with me each step of the way! ES: What was the process like of getting a job through Employment Solutions? JM: It was low-stress and easy. I loved working with the recruiter who interviewed me and found multiple jobs based on my skills. They took the time to get to know where I wanted to go in a career, and it turned into a wonderful 3-year employment! ES: What was your career path after you were placed by Employment Solutions? JM: I started as a Customer Service Representative at the company they placed me with. After three months I was hired on full time, and then I applied to be a Service Tech! I was hired into that new role and about a year later I was promoted to Warranty Service Administrator. Most recently, I accepted an offer with a construction company in August 2018 working Welding QA/QC, and I left on good terms with the company I was originally placed with. ES: Why did you stay at the company Employment Solutions placed you with for so long? JM: The people were amazing, and the work was interesting. I worked with the most brilliant and creative engineers on a team that cared for each other. I learned something every day and was coached to become more thoughtful and educated in the welding industry. ES: What inspired you to become a welder? 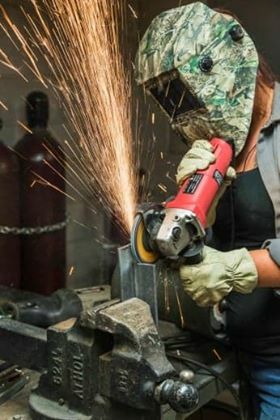 JM: I am not a welder like a person in a fabrication shop or a pipefitter, but I have an enormous passion for the industry since working in customer service at the welding company where Employment Solutions placed me. I love the trade and have always wanted to weld, and this gave me a way in. ES: What is your job now? I am a Quality Engineer for Turner Construction. I specialize in piping and structural steel for an industrial project. It’s been an incredible experience! ES: How did you hear about it? JM: A family friend got my resume in front of the right people. I advise anyone to make and keep relationships with people in the industry-you never know! In fact, the previous COO at the company Employment Solutions placed me at gave our team that exact advice on his last day before going to work for a huge manufacturing company. It really stuck with me. ES: What is your advice to someone looking for a job? JM: Utilize a staffing and recruiting company. It’s great to feel like you have someone on your side! Also, connect with people in the industry you want to pursue. ES: What is your advice to someone looking for a job through Employment Solutions? JM: Dress your best, come prepared, and be 100 percent open and honest about your career goals. They want to help you find something that fits. ES: What is your advice to someone looking to become a welder? JM: Trade school is a great place to start. Front Range Community College for example, has an amazing program with great professors. Go to events around the industry and meet people. People, especially in trades, want to teach and pass on their knowledge to the next generation. Have a solid work ethic- I pulled a 16-hour day this week! You must keep the end goal in mind. ES: What is your advice to women who want to work in a male-dominated field like manufacturing or welding? JM: I could write a novel on this! Work hard and stay focused on your goals, but more importantly, stay focused on the goals of the company you work for. Be kind, honest and transparent- especially with your superiors. Don’t be afraid to be assertive with your ideas. Worst thing that happens is it gets turned down, then you get to develop a new one! Don’t be bullied and focus on being a “worker among workers.” Pay your dues and respect the guys who have 30 years in the industry. Follow your gut and lean on the women you work with! If you’re ready to jump-start your career and follow your dreams, we can help! We will be there every step of the way. Still have questions about what the process is like? Check out our FAQ page here.